Popcorn science! | Mrs. P's Specialties! 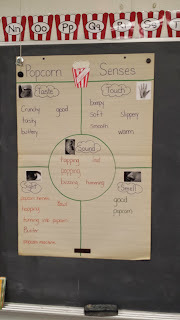 This week we are working on the five senses so for science we used all five senses to explore popcorn. Yum! We started by reviewing the five senses and the body parts they are associated with. Then I revealed the hot air popcorn maker. None of my students had ever seen one before! 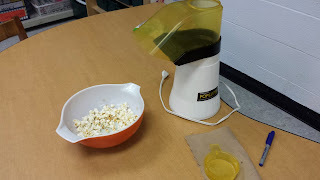 We felt the popcorn kernels and listened as the kernels tapped into the machine. They were AMAZED when popcorn started flowing out of the machine. It was sooo cute!! We made a chart and worked on adding descriptive words to each section as we smelled, touched, tasted and looked at the popcon. 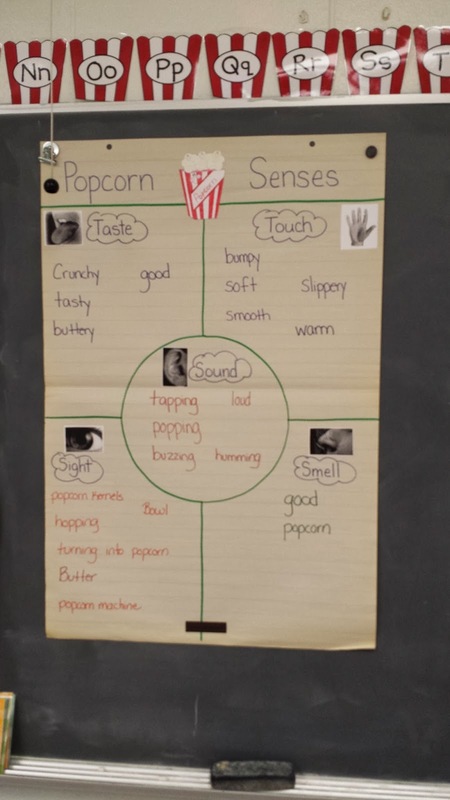 Once we filled the chart in we then added butter to the popcorn and did it all over again to see if the butter changed the way it felt, smelled and tasted. The kids thought this was the best science lesson I have ever done! LOL! There was very little left in the bowl to explore by the end of the lesson.